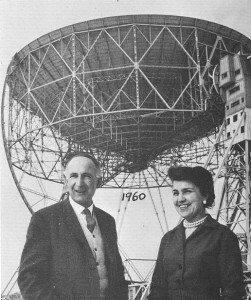 Bernard Lovell, founder of Jodrell Bank, died yesterday, August 6, 2012, at the age of 98. Please visit the Jodrell Bank Centre for Astrophysics website for his obituary, an online book of condolence, links to audio and viedo interviews, and links to his 1958 BBC Reith Lectures. Click here for a few images and my post on the 76-meter Mark I (Lovell) Telescope.